The Lystraian Saint - Paul first met his young friend Timothy at Lystra (Acts 15:1-3a), and while there, invited him to accompany him on a crusade (Acts 16:3-5). As time passed, the "Lystraian saint" became the apostle's most trusted colleague. When Paul had his doubts about the health of the Thessalonian fellowship, he sent Timothy to offer assistance (1 Thessalonians 3:1-5). When a division threatened the life of the congregation at Corinth, it was Timothy who was sent as Paul's personal emissary to heal the wounds (1 Corinthians 4:17). When Paul was called away from the great church at Ephesus, it was Timothy who was left in charge (1 Timothy 1:3). As the young pastor labored in the Ephesian congregation, he received two letters from his "father in the faith." Both are letters in which Paul gives counsel to a shepherd of the flock (1 Timothy 1:2, 2 Timothy 1:2). 1 Timothy - Paul reviews the reasons why he encouraged Timothy to stay in Ephesus, expresses thanksgiving for the unmerited favor which he himself has received from God's hand, and then charges Timothy to "wage the good warfare, holding faith and a good conscience". He follows these introductory remarks with specific counsel. Build Upon the Foundations of Prayer and Worship - Paul encourages Timothy to remember it takes the King's power to do the King's work. Paul found human powers alone to be totally inadequate for the tasks of the Kingdom. If persons are to be won and God's will be done, then the saints must pray. Choose Leadership Carefully - The early Christian church grew phenomenally. The apostles could not possibly bear the brunt of leadership everywhere. Each new body must choose its own leaders. Paul knew the strength of the church would be closely related to the strength of its leaders. 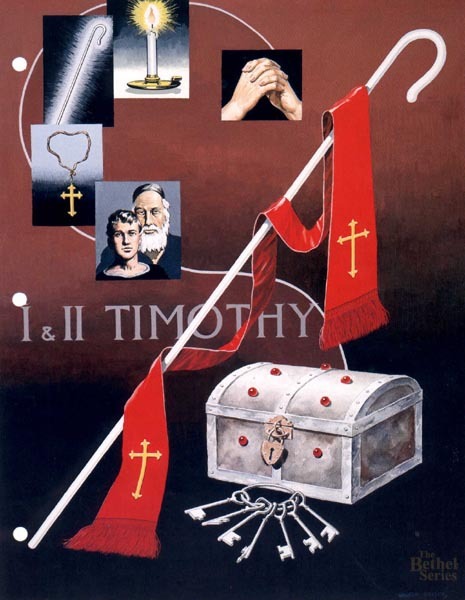 He encouraged Timothy to exercise care in the selection of who desired to be either bishop or deacon. The chosen leaders must be: above reproach, husband of one wife, temperate, sensible, dignified, hospitable, an apt teacher, no drunkard, gentle, non-quarrelsome, no lover of money, relationally astute, one who had done some growing in the faith, and well thought of by outsiders. Combat False Teaching - Have you heard the statement, "It makes no difference what a person's religion is, as long as he or she is sincere." ? This is false teaching! If one religious belief is as good as the next and sincerity is the measure by which God judges people then, the religious people who hung Jesus on the cross were as blameless in the eyes of the Father as the sincere religious man who died at their hands. If it is sincerity that saves and not the truth, then Calvary was a farce, and the Savior's blood was shed for nothing! Wrong beliefs about God issue in wrong actions toward him. Combat false teaching by holding forth the truth! Respect Elders - Paul advised Timothy, not to rebuke an older man, but to exhort him as a father and to treat older women like mothers. It is priceless counsel to reap the rewards of sharing in wisdom and understanding of those who are older than ourselves. Wise people learn much because they have listened much. Those who reject the biblical admonishment to respect their elders, and who flout authority when they are young, will flout authority when they are old. They will learn nothing from their superiors for they recognize no superiors. They will yield to no counsel for they are their own counsel. Hence, they will limit their understanding to a puny wisdom of their own, which will fail them and leave them to wander aimlessly, wondering why life has passed them by. Such is the peril and the price paid by those who respect no one but themselves. The rich treasures of God's grace are available in Christ. I covet those treasures for you and for those to whom you minister. Therefore, I encourage you to fight the darkness, and hold fast to the truth. It is not an easy task. If you are to find the stength and the wisdom for it, then you must lean heavily upon the Lord. Seek your strength in Christ. Remember that servants of the Lord are sometimes called upon to suffer for the truths which are dear to them. The road will not always be easy. The task can be difficult and demanding; and if you want treasure, then you must endure your share of suffering as a good soldier of Christ. Be single-minded then. Remember who you are and whom you serve. Do not divide yourself between two masters. Be diligent. Be patient, and entrust the message to the faithful among you. Fulfill your ministry. White staff and red stole - Paul gives counsel to a shepherd of the flock. Folded hands - Build the kingdom upon the foundations of prayer and pure worship. Burning candle - Dispel the darkness by being a light. Staff in darkness - Combat false teaching. Neckband with cross attached - Enjoin the bishop and the deacon to live lives worthy of their calling. Lad and elderly man - Respect the aged. Jeweled chest - The rich treasures of God's grace have been made available in Christ. Key 1 - Hold fast to the truth. Key 2 - Seek your strength in Christ. Key 3 - Endure you share of suffering as a good soldier of Christ. Key 4 - Be single-minded. Key 5 - Be diligent. Key 6 - Be patient. Key 7 - Entrust the message to the faithful.